Lock in a great price for Comfort Inn & Suites Carbondale – rated 8.4 by recent guests! The room was clean and comfortable as well as the breakfast provided. Nice rooms, breakfast,staff and hot tub. Believe our room rate was high but was probably because of the X Games. Comfortable bed Good breakfast choices They kept the bag I left with medical equipment so I could retrieve it. everything was very nice and the property very neat and pretty!! I like the location, but for me being right in downtown Carbondale is not a priority. It is walkable if you’re really motivated, but downtown is an easy bike ride (guessing 3 mins) and they have bikes you can use. Location is perfect if you’re going between Glenwood Springs and Snowmass. I was so grateful and appreciative to return to a very clean room and bath after 4 very very long work days. I had excellent wake up call service each morning and the breakfasts were delicious, lots of food and enjoyable room. Staff did the very best/made the most out of every thing they had... i appreciate that. very busy with a lot of tradesmen customers, and yet it was a pleasant environment to relax in. Location was good! Close to the highway, but not to close. It's right on the river! Close to the main highway and town center. Great breakfast included. Comfort Inn & Suites Carbondale This rating is a reflection of how the property compares to the industry standard when it comes to price, facilities and services available. It's based on a self-evaluation by the property. Use this rating to help choose your stay! Centrally located in the beautiful Roaring Fork Valley, the Comfort Inn & Suites hotel is ideally located at the crossroads between Aspen, Glenwood Springs and Redstone, on the banks of the Roaring Fork River. This hotel is minutes from the White River National Forest, Colorado Mountain College, Aspen Mountain and the Hot Springs Lodge and Pool. Additional points of interest include: Snowmass ski area, sunlight mountain resort ski area, Glenwood Caverns Adventure Park, River Valley Ranch Golf Club and Maroon Bells wilderness area. 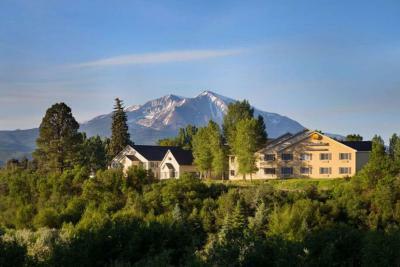 The hotel is minutes from many outdoor activities, including biking, rafting, horseback riding, mountain climbing and snowmobiling. The Aspen/Pitkin County Airport is 30 minutes away. Full-service amenities and features include: free wireless high-speed Internet access in all rooms and indoor heated pool. The hotel is pet-friendly. Your Morning Breakfast is full of hot options, making breakfast at the Comfort Inn & Suites the perfect way to start your day. Enjoy our free hot breakfast featuring eggs, meat, yogurt, fresh fruit, cereal and more, including your choice of hot waffle flavors. Guests of the hotel can enjoy fresh baked cookies served nightly. After a long day, relax in the indoor heated pool and hot tub. The meeting room is available to accommodate most events and business functions. Business travelers will also appreciate two-line telephones and access to copy and fax services. All spacious guest rooms and suites feature river or mountain views, irons, ironing boards, coffee makers and hair dryers. Suites also include refrigerators, microwaves and separate living and work areas. Laundry facilities are located on the property for guest convenience. When would you like to stay at Comfort Inn & Suites Carbondale? House Rules Comfort Inn & Suites Carbondale takes special requests – add in the next step! Comfort Inn &amp; Suites Carbondale accepts these cards and reserves the right to temporarily hold an amount prior to arrival. Comfort Inn & Suites Carbondale accepts these cards and reserves the right to temporarily hold an amount prior to arrival. Pricing was slightly high as well as parking being scarce late at night. Beds were comfortable. Staff was nice. Waking up to the view of the snowy mountains. There is no elevator to the second floor and no ice machine. Extremely dirty carpets especially in hallway made for an unpleasant experience. Our first room wreaked of urine... second room was musty. We spent as little time at the hotel as possible. No elevator in the hotel to carry suitcase to second floor. Window in the room had cobwebs. The parking lot is very small. If you have a camper or a boat your will most likely have to park on the street.